KCET Rental Televisions: One-Channel RTC-Approved TV for Scientologists! – OTVIIIisGrrr8! KCET Rental Televisions: One-Channel RTC-Approved TV for Scientologists! The KCET Rental Television receives only one RTC-approved broadcast channel: Scientology Media Productions. The KCET B&W Rental Television can be rented monthly for $1995. Rental color televisions are $2995 per month. The home antenna required for broadcast TV reception is a separate fee of $595 per month. Scientology Media Productions content is available only on KCET rental televisions for an additional $1995 per month plus + viewers must be, at a minimum, IAS Humanitarians and Cornerstone members in good standing with the Church. 2-4 sec check intensives are required as part of the application process necessary to rent a KCET Rental Television. Scientology Media Productions content is broadcast in 60 minute increments. After watching the content, viewers must telex in a signed success story to Ethics in order to be approved to watch the next 60 minute broadcast. 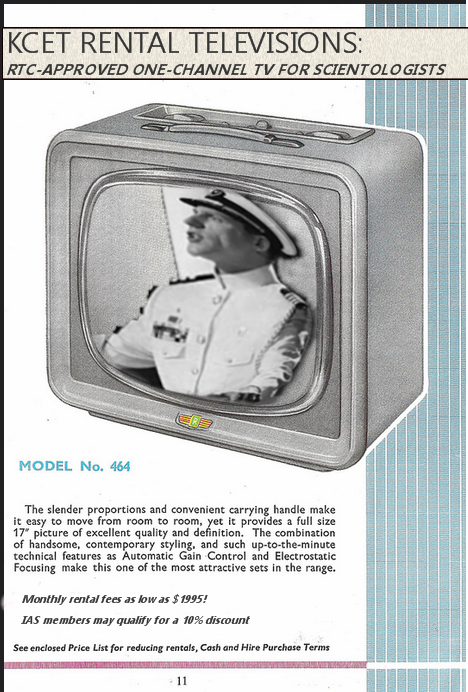 KCET Rental Televisions: Keeping Scientologists safe from Entheta! Captain Miscavige Orders the Nuclear Option Against HBO! Here’s hoping it can connect up to my RTC approved Beta Video player?! No recordings of the sacred words of COB are allowed. SPs have been known to use them for J&Ding of His Ableness’s most Ecclesiastical Personage. I presume that every Scientologist will be required to own 2 sets – 1 for each eye so that Captain Miscavige can be viewed in 3D? You need at least 4, so you will have backups in case two of the sets break at once. This is a beauty….and a bargain. With a large 17″ screen, Captain Miscaviage will appear only slightly smaller than real life!! Want case gain? IAS studies factually demonstrated the exclusive automatic gain control feature resulted in no less than 47x case gain. This TV will rocket you up the bridge!! Don’t wait. Supplies are limited. Call now before they’re gone!! Finally, a TV so old, it still shows Milton Berle on Tuesday nights. I hate to have critical thoughts, but I am going to wait for the color model to come out next year.